For the album, see Grand Unification (album). A Grand Unified Theory (GUT) is a model in particle physics in which, at high energy, the three gauge interactions of the Standard Model that define the electromagnetic, weak, and strong interactions, or forces, are merged into a single force. Although this unified force has not been directly observed, the many GUT models theorize its existence. If unification of these three interactions is possible, it raises the possibility that there was a grand unification epoch in the very early universe in which these three fundamental interactions were not yet distinct. Experiments have confirmed that at high energy, the electromagnetic interaction and weak interaction unify into a single electroweak interaction. GUT models predict that at even higher energy, the strong interaction and the electroweak interaction will unify into a single electronuclear interaction. This interaction is characterized by one larger gauge symmetry and thus several force carriers, but one unified coupling constant. Unifying gravity with the electronuclear interaction would provide a theory of everything (TOE) rather than a GUT. GUTs are often seen as an intermediate step towards a TOE. The novel particles predicted by GUT models are expected to have extremely low masses around the GUT scale[clarification needed]—just a few orders of magnitude below the Planck scale—and so are well beyond the reach of any foreseen particle collider experiments. Therefore, the particles predicted by GUT models will be unable to be observed directly and instead the effects of grand unification might be detected through indirect observations such as proton decay, electric dipole moments of elementary particles, or the properties of neutrinos. Some GUTs, such as the Pati-Salam model, predict the existence of magnetic monopoles. GUT models which aim to be completely realistic are quite complicated, even compared to the Standard Model, because they need to introduce additional fields and interactions, or even additional dimensions of space. The main reason for this complexity lies in the difficulty of reproducing the observed fermion masses and mixing angles which may be related to an existence of some additional family symmetries beyond the conventional GUT models. Due to this difficulty, and due to the lack of any observed effect of grand unification so far, there is no generally accepted GUT model. 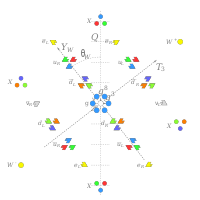 Models that do not unify the three interactions using one simple group as the gauge symmetry, but do so using semisimple groups, can exhibit similar properties and are sometimes referred to as Grand Unified Theories as well. Are the three forces of the Standard Model unified at high energies? By which symmetry is this unification governed? Can Grand Unification explain the number of fermion generations and their masses? Historically, the first true GUT which was based on the simple Lie group SU(5), was proposed by Howard Georgi and Sheldon Glashow in 1974. The Georgi–Glashow model was preceded by the semisimple Lie algebra Pati–Salam model by Abdus Salam and Jogesh Pati, who pioneered the idea to unify gauge interactions. The acronym GUT was first coined in 1978 by CERN researchers John Ellis, Andrzej Buras, Mary K. Gaillard, and Dimitri Nanopoulos, however in the final version of their paper they opted for the less anatomical GUM (Grand Unification Mass). Nanopoulos later that year was the first to use the acronym in a paper. The supposition that the electric charges of electrons and protons seem to cancel each other exactly to extreme precision is essential for the existence of the macroscopic world as we know it, but this important property of elementary particles is not explained in the Standard Model of particle physics. While the description of strong and weak interactions within the Standard Model is based on gauge symmetries governed by the simple symmetry groups SU(3) and SU(2) which allow only discrete charges, the remaining component, the weak hypercharge interaction is described by an abelian symmetry U(1) which in principle allows for arbitrary charge assignments. [note 1] The observed charge quantization, namely the postulation that all known elementary particles carry electric charges which are exact multiples of ⅓ of the "elementary" charge, has led to the idea that hypercharge interactions and possibly the strong and weak interactions might be embedded in one Grand Unified interaction described by a single, larger simple symmetry group containing the Standard Model. This would automatically predict the quantized nature and values of all elementary particle charges. Since this also results in a prediction for the relative strengths of the fundamental interactions which we observe, in particular the weak mixing angle, Grand Unification ideally reduces the number of independent input parameters, but is also constrained by observations. Grand Unification is reminiscent of the unification of electric and magnetic forces by Maxwell's theory of electromagnetism in the 19th century, but its physical implications and mathematical structure are qualitatively different. For an elementary introduction to how Lie algebras are related to particle physics, see Particle physics and representation theory. The pattern of weak isospins, weak hypercharges, and strong charges for particles in the SU(5) model, rotated by the predicted weak mixing angle, showing electric charge roughly along the vertical. In addition to Standard Model particles, the theory includes twelve colored X bosons, responsible for proton decay. Such group symmetries allow the reinterpretation of several known particles[which?] as different states of a single particle field. However, it is not obvious that the simplest possible choices for the extended "Grand Unified" symmetry should yield the correct inventory of elementary particles. The fact that all currently known matter particles fit perfectly into three copies of the smallest group representations of SU(5) and immediately carry the correct observed charges, is one of the first and most important reasons why people believe that a Grand Unified Theory might actually be realized in nature. The two smallest irreducible representations of SU(5) are 5[clarification needed] and 10. In the standard assignment, the 5 contains the charge conjugates of the right-handed down-type quark color triplet and a left-handed lepton isospin doublet, while the 10 contains the six up-type quark components, the left-handed down-type quark color triplet, and the right-handed electron. This scheme has to be replicated for each of the three known generations of matter. It is notable that the theory is anomaly free with this matter content. The hypothetical right-handed neutrinos are a singlet of SU(5), which means its mass is not forbidden by any symmetry; it doesn't need a spontaneous symmetry breaking which explains why its mass would be heavy. [clarification needed] (see seesaw mechanism). 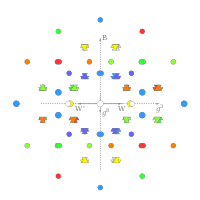 The pattern of weak isospin, W, weaker isospin, W', strong g3 and g8, and baryon minus lepton, B, charges for particles in the SO(10) Grand Unified Theory, rotated to show the embedding in E6. Here, the unification of matter is even more complete, since the irreducible spinor representation 16 contains both the 5 and 10 of SU(5) and a right-handed neutrino, and thus the complete particle content of one generation of the extended standard model with neutrino masses. This is already the largest simple group which achieves the unification of matter in a scheme involving only the already known matter particles (apart from the Higgs sector). Since different standard model fermions are grouped together in larger representations, GUTs specifically predict relations among the fermion masses, such as between the electron and the down quark, the muon and the strange quark, and the tau lepton and the bottom quark for SU(5) and SO(10). Some of these mass relations hold approximately, but most don't (see Georgi-Jarlskog mass relation). The boson matrix for SO(10) is found by taking the 15 × 15 matrix from the 10 + 5 representation of SU(5) and adding an extra row and column for the right-handed neutrino. The bosons are found by adding a partner to each of the 20 charged bosons (2 right-handed W bosons, 6 massive charged gluons and 12 X/Y type bosons) and adding an extra heavy neutral Z-boson to make 5 neutral bosons in total. The boson matrix will have a boson or its new partner in each row and column. These pairs combine to create the familiar 16D Dirac spinor matrices of SO(10). In some forms of string theory, including E8 × E8 heterotic string theory, the resultant four-dimensional theory after spontaneous compactification on a six-dimensional Calabi-Yau manifold resembles a GUT based on the group E6. Notably E6 is the only exceptional simple Lie group to have any complex representations, a requirement for a theory to contain chiral fermions (namely all weakly-interacting fermions). Hence the other four (G2, F4, E7, and E8) can't be the gauge group of a GUT. Non-chiral extensions of the Standard Model with vectorlike split-multiplet particle spectra which naturally appear in the higher SU(N) GUTs considerably modify the desert physics and lead to the realistic (string-scale) grand unification for conventional three quark-lepton families even without using supersymmetry (see below). On the other hand, due to a new missing VEV mechanism emerging in the supersymmetric SU(8) GUT the simultaneous solution to the gauge hierarchy (doublet-triplet splitting) problem and problem of unification of flavor can be found. GUTs with four families / generations, SU(8): Assuming 4 generations of fermions instead of 3 makes a total of 64 types of particles. These can be put into 64 = 8 + 56 representations of SU(8). This can be divided into SU(5) × SU(3)F × U(1) which is the SU(5) theory together with some heavy bosons which act on the generation number. GUTs with four families / generations, O(16): Again assuming 4 generations of fermions, the 128 particles and anti-particles can be put into a single spinor representation of O(16). It can be noted that a generation of 16 fermions can be put into the form of an octonion with each element of the octonion being an 8-vector. If the 3 generations are then put in a 3x3 hermitian matrix with certain additions for the diagonal elements then these matrices form an exceptional (Grassmann-) Jordan algebra, which has the symmetry group of one of the exceptional Lie groups (F4, E6, E7 or E8) depending on the details. Because they are fermions the anti-commutators of the Jordan algebra become commutators. It is known that E6 has subgroup O(10) and so is big enough to include the Standard Model. An E8 gauge group, for example, would have 8 neutral bosons, 120 charged bosons and 120 charged anti-bosons. To account for the 248 fermions in the lowest multiplet of E8, these would either have to include anti-particles (and so have baryogenesis), have new undiscovered particles, or have gravity-like (spin connection) bosons affecting elements of the particles spin direction. Each of these possess theoretical problems. Other structures have been suggested including Lie 3-algebras and Lie superalgebras. Neither of these fit with Yang–Mills theory. In particular Lie superalgebras would introduce bosons with the wrong[clarification needed] statistics. Supersymmetry however does fit with Yang–Mills. For example, N=4 Super Yang Mills Theory requires an SU(N) gauge group[clarification needed]. The unification of forces is possible due to the energy scale dependence of force coupling parameters in quantum field theory called renormalization group running, which allows parameters with vastly different values at usual energies to converge to a single value at a much higher energy scale. It is commonly believed that this matching is unlikely to be a coincidence, and is often quoted as one of the main motivations to further investigate supersymmetric theories despite the fact that no supersymmetric partner particles have been experimentally observed. Also, most model builders simply assume supersymmetry because it solves the hierarchy problem—i.e., it stabilizes the electroweak Higgs mass against radiative corrections. Since Majorana masses of the right-handed neutrino are forbidden by SO(10) symmetry, SO(10) GUTs predict the Majorana masses of right-handed neutrinos to be close to the GUT scale where the symmetry is spontaneously broken in those models. In supersymmetric GUTs, this scale tends to be larger than would be desirable to obtain realistic masses of the light, mostly left-handed neutrinos (see neutrino oscillation) via the seesaw mechanism. Note: These models refer to Lie algebras not to Lie groups. The Lie group could be [SU(4) × SU(2) × SU(2)]/Z2, just to take a random example. The most promising candidate is SO(10). (Minimal) SO(10) does not contain any exotic fermions (i.e. additional fermions besides the Standard Model fermions and the right-handed neutrino), and it unifies each generation into a single irreducible representation. A number of other GUT models are based upon subgroups of SO(10). They are the minimal left-right model, SU(5), flipped SU(5) and the Pati–Salam model. The GUT group E6 contains SO(10), but models based upon it are significantly more complicated. The primary reason for studying E6 models comes from E8 × E8 heterotic string theory. GUT models generically predict the existence of topological defects such as monopoles, cosmic strings, domain walls, and others. But none have been observed. Their absence is known as the monopole problem in cosmology. Many GUT models also predict proton decay, although not the Pati–Salam model; proton decay has never been observed by experiments. The minimal experimental limit on the proton's lifetime pretty much rules out minimal SU(5) and heavily constrains the other models. The lack of detected supersymmetry to date also constrains many models. Proton Decay. These graphics refer to the X bosons and Higgs bosons. Some GUT theories like SU(5) and SO(10) suffer from what is called the doublet-triplet problem. These theories predict that for each electroweak Higgs doublet, there is a corresponding colored Higgs triplet field with a very small mass (many orders of magnitude smaller than the GUT scale here). In theory, unifying quarks with leptons, the Higgs doublet would also be unified with a Higgs triplet. Such triplets have not been observed. They would also cause extremely rapid proton decay (far below current experimental limits) and prevent the gauge coupling strengths from running together in the renormalization group. Most GUT models require a threefold replication of the matter fields. As such, they do not explain why there are three generations of fermions. Most GUT models also fail to explain the little hierarchy between the fermion masses for different generations. A GUT model consists of a gauge group which is a compact Lie group, a connection form for that Lie group, a Yang–Mills action for that connection given by an invariant symmetric bilinear form over its Lie algebra (which is specified by a coupling constant for each factor), a Higgs sector consisting of a number of scalar fields taking on values within real/complex representations of the Lie group and chiral Weyl fermions taking on values within a complex rep of the Lie group. The Lie group contains the Standard Model group and the Higgs fields acquire VEVs leading to a spontaneous symmetry breaking to the Standard Model. The Weyl fermions represent matter. There is currently no hard evidence that nature is described by a Grand Unified Theory. The discovery of neutrino oscillations indicates that the Standard Model is incomplete and has led to renewed interest toward certain GUT such as SO(10). One of the few possible experimental tests of certain GUT is proton decay and also fermion masses. There are a few more special tests for supersymmetric GUT. However, minimum proton lifetimes from research (at or exceeding the 1034-1035 year range) have ruled out simpler GUTs and most non-SUSY models. The maximum upper limit on proton lifetime (if unstable), is calculated at 6 x 1039 years for SUSY models and 1.4 x 1036 years for minimal non-SUSY GUTs. The gauge coupling strengths of QCD, the weak interaction and hypercharge seem to meet at a common length scale called the GUT scale and equal approximately to 1016 GeV (slightly less than the Planck energy of 1019 GeV), which is somewhat suggestive. This interesting numerical observation is called the gauge coupling unification, and it works particularly well if one assumes the existence of superpartners of the Standard Model particles. Still it is possible to achieve the same by postulating, for instance, that ordinary (non supersymmetric) SO(10) models break with an intermediate gauge scale, such as the one of Pati–Salam group. ^ There are however certain constraints on the choice of particle charges from theoretical consistency, in particular anomaly cancellation. ^ Ross, G. (1984). Grand Unified Theories. Westview Press. ISBN 978-0-8053-6968-7. ^ Georgi, H.; Glashow, S.L. (1974). "Unity of All Elementary Particle Forces". Physical Review Letters. 32 (8): 438–41. Bibcode:1974PhRvL..32..438G. doi:10.1103/PhysRevLett.32.438. ^ Pati, J.; Salam, A. (1974). "Lepton Number as the Fourth Color". Physical Review D. 10 (1): 275–89. Bibcode:1974PhRvD..10..275P. doi:10.1103/PhysRevD.10.275. ^ Buras, A.J. ; Ellis, J.; Gaillard, M.K. ; Nanopoulos, D.V. (1978). "Aspects of the grand unification of strong, weak and electromagnetic interactions" (PDF). Nuclear Physics B. 135 (1): 66–92. Bibcode:1978NuPhB.135...66B. doi:10.1016/0550-3213(78)90214-6. Retrieved 2011-03-21. ^ Nanopoulos, D.V. (1979). "Protons Are Not Forever". Orbis Scientiae. 1: 91. Harvard Preprint HUTP-78/A062. ^ Ellis, J. (2002). "Physics gets physical". Nature. 415 (6875): 957. Bibcode:2002Natur.415..957E. doi:10.1038/415957b. PMID 11875539. ^ Grumiller, Daniel (2010). Fundamental Interactions: A Memorial Volume for Wolfgang Kummer. World Scientific. p. 351. ISBN 978-981-4277-83-9. ^ Pran, Nath; T, Vaughn Michael; George, Alverson (2005-08-19). Pascos 2004: Part I: Particles, Strings And Cosmology; Part Ii: Themes In Unification -- The Pran Nath Festschrift - Proceedings Of The Tenth International Symposium. World Scientific. ISBN 978-981-4479-96-7. Stephen Hawking, A Brief History of Time, includes a brief popular overview.